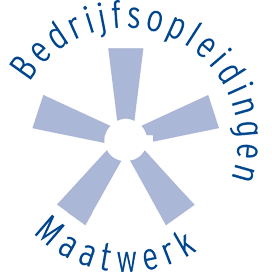 In cooperation with Rotterdam School of Management, Erasmus University (RSM), we have organised the Black Belt Excellence Programme. This is the most complete Lean Six Sigma training programme thus far, supplemented with a change management module developed by RSM. 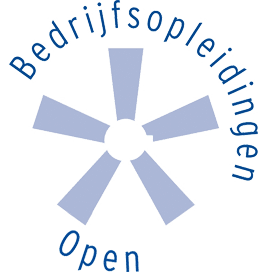 The role of the Black Belt Excellence is to translate an organisation’s Operational Excellence strategy into clearly defined improvement initiatives together with the Master Black Belt(s). With a team of Green Belts and Lean specialists at their side, the Black Belt Excellence executes these improvement initiatives and in doing so improves efficiency and customer value. The Black Belt Excellence programme is an exclusive course which enables participants to distinguish themselves on the international employment market. During the Black Belt Excellence programme you will be trained to execute trans-departmental improvement projects. At international organisations, projects will also often cover multiple countries, and you will have to cope with cultural differences. 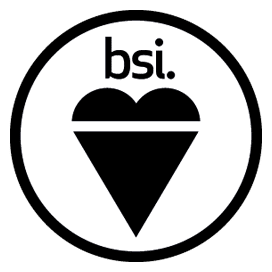 Thanks to the Change Management module developed by RSM (a top 10 Business University) and the Black Belt curriculum that is in accordance with the international ISO18404 standards, you can be certain of your ability to successfully execute your Lean Six Sigma projects. The curriculum consists of 14 days, of which 11 days will focus on Lean Six Sigma, and the other 3 days will be centred around change management and leadership; the two key-elements to being successful as a Black Belt. 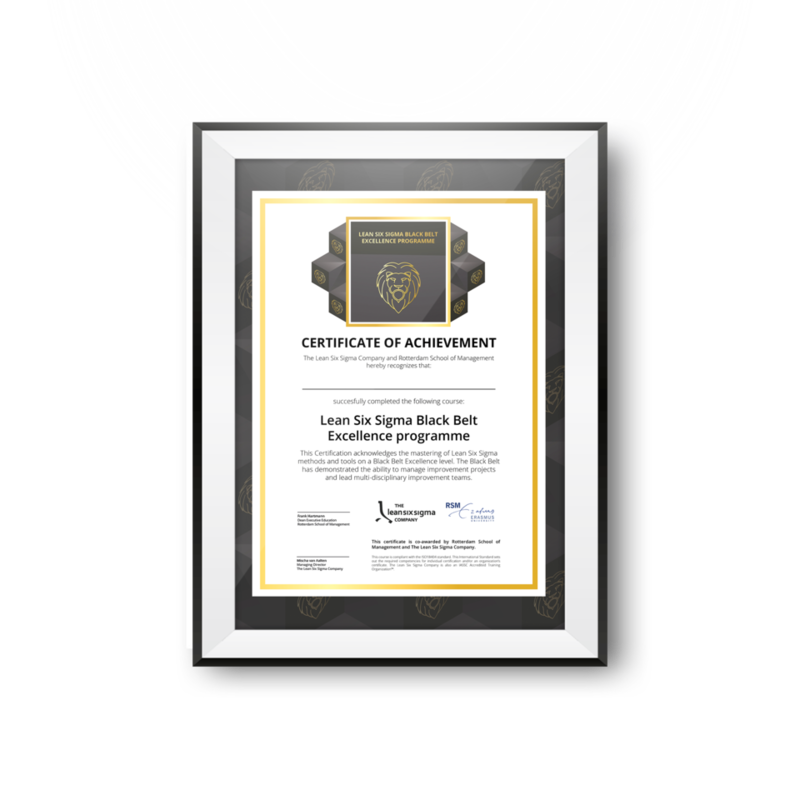 The programme is based on the international ISO 18404 standards and meets all set requirements to certify as a Black Belt. 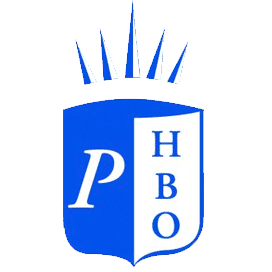 The course is partially provided by Rotterdam School of Management and partially by The Lean Six Sigma Company. The course is provided in English and contains 2 assessment moments. A written exam and a practical exam. Therefore completion of a practical assignment is mandatory. RSM is ranked as one of the best European business schools, including 10th in the Financial Times meta-ranking and 3rd in Western Europe by Eduniversal. RSM has an acceptance rate of between 20–25% and is in the 1% of business schools worldwide which possess the distinguished Triple Crown Accreditation – AMBA, EQUIS and AACSB. These days have been set up around a simulation which is a key element throughout the training. – Your role in change management. – Leading during change management. – Experimenting with different types of interventions. Dr Barbara Banda is a specialist in leadership development, business strategy and organisational change, and is highly skilled and experienced in coaching senior leaders and board-level executives, as well as leading large- scale strategic projects for multinationals, governmentdepartments and non-profits. She is passionate abouther work having a direct and lasting impact on individuals and organisations. Her doctoral research focused on the importance of connecting management education to the workplace. She has designed and delivered blended leadership development coaching for global organisations, and is a former professor of practice (one who promotes the integration of academic scholarship with practical experience) at Hult/Ashridge Business School. In addition to consultancy, Barbara is a visiting faculty member at RSM, for Duke Corporate Education, and at TIAS School for Business and Society. She has a PhD in Management Learning from theUniversity of Oxford, an MA in Organisational Change, anMSc in Training and Performance Management, an MBA,and a BA in German and Russian. Barbara spent 13 years in senior roles in marketing and business development in the pharmaceutical and healthcare industry, and has experience in the automotive and recruitment services sectors. A practical assignment is an improvement project often within your own organisation. The project has to visibly contribute to the aim of your organisation: generating money and/or improving customer satisfaction. Care institutions and governments more often aim to improve customer satisfaction and lowering the operational costs. In short: an improvement project must have a positive business case. Examples would be: Improving customer satisfaction, less customer complaints, improved quality of products or services and lowering the costs. These results have to be achieved by using Lean and Six Sigma techniques. Contact us for all your questions. We are VAT exempt for organisations which cannot deduct the VAT (private individuals, care institutions, governments, financial services). 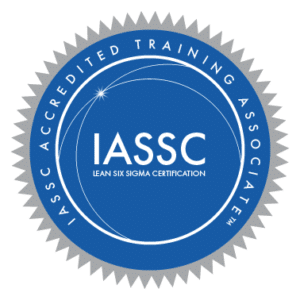 The Lean Six Sigma Company courses adhere to the ISO18404 standard, which defines the competencies for Lean Six Sigma professionals. Beware: The Black Belt Excellence Programme has not yet been entered into the 2017 prospectus. Please contact us with specific queries.